The bridegroom’s family was poor, the bride’s family was poor, and the 1968 wedding was … well, poor. But that is man’s estimation. Ricardo and Ema loved the Lord with all their hearts. They had come into great riches a few years back, when the King of the Universe had come knocking on their hearts’ doors through the faithful testimony of NTMU missionaries. They gladly let HIM in, surrendering all. It was some time after this when they got to know each other. Again something stirred those hearts. It was human love this time. But both realized their hearts might easily deceive them and so, consciously, with lots of prayer, all was put into their Lord’s hands. They asked HIM to take charge and guide perfectly. He did! And then there was this great poor/rich wedding! They lived happily ever after, while seven wonderful children came to gladden their hearts. One went on to Heaven before them. All of them today praise God for the rich inheritance their poor parents passed on to them. When David Livingstone, famous Scottish missionary and explorer of the XIX century, had his parents’ tombstone engraved, the last line honored them for having been “… poor and pious …”. His friends tried to persuade him to change this into: “.. poor but pious ..”, but David chose not to, arguing that not only the piety, but also the poverty, had been a blessing in their lives. Like David Livingstone, I also can say that I am the son of poor and pious parents. 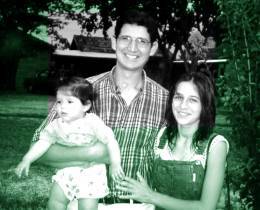 I was born on October 17, 1969, into the home of Ricardo and Ema López. The childhood in that home left me many precious memories: the wood stove, the home baked bread, the family ‘altar’ ….., but most of all I remember the times when Mom and Dad would lead us children to look to the Lord in prayer because of some special need. I am the eldest of seven brothers and sisters (one of whom died), and I can honestly say that to have been born in a poor home, of pious parents, has been a real blessing to me. From our earliest childhood Mom and Dad taught all of us to call on the Lord in all our needs. For that evening an ‘agape’ was planned with all of the believers, when each one would bring something to share with the others. We had nothing left to share …! Still around the table, we prayed for this need and other needs. We hadn’t quite finished praying when there was a knock at the door. Someone had come to collect his watch. Dad, who was a part-time watchmaker, had repaired it for him ages ago. After all that time, God, keeping his promise of Isaiah 65, got the man to come for his watch! When he had paid Dad, there was sufficient to buy and prepare our share for the ‘agape’! I vividly remember the joy in Dad’s eyes as he later told the other believers about God’s faithfulness. What a blessing it was to me as a child to see God’s marvels!! On another occasion, when I was playing in my aunt’s house, she called me and gave me a bag with bread, meat and other things to take home. I naturally thought it was something my mother had arranged with her, but what a surprise: as I stepped into our home, I found the family in prayer, asking God to supply the needs of that day, and there I was standing in the doorway with God’s answer in my hands! It made me feel like the ravens that supplied Elijah with food. Being allowed to prove God’s faithfulness certainly left its mark on me! Every need was a motive to pray: my mother’s health, my father’s work, clothes, shoes, studies, all was put before the Lord. Today I myself am a husband and father. What a blessing to realize that the God of my parents is my God too! How wonderful to continue proving God’s faithfulness, now in my own home. This year Mom and Dad celebrate 33 years of married life. It still is an inspiration to see them very much in love, walking hand in hand or looking into each other’s eyes. Mom is now gray-haired and has a number of wrinkles, but, just as virtuous and tender as ever, she still waits for Dad to come home from work with a hug and a kiss! There is this saying that “The best thing a father can do for his children is to love the mother”. I can certainly confirm this as a fact. I have always felt loved and will continue to do so. When they hugged, they were in reality hugging us, their children, and the family ties were being kept strong and tight. I am grateful to God for my parents’ ‘piety’ (godliness). As a child they led me to Christ. They used the Bible to teach me to read and it was the family prayer times that taught me to talk. They also made sure that we understood the importance of meeting with the other believers and of always getting there on time. Later, as a teenager, I was baptized. How great, o Lord, is the love I perceive in the way you surrounded me with such a home! What an inheritance I received from my parents, what a priceless treasure! It cannot be compared to all the gold in the world! In that humble wooden home, in that small village of Piray (Argentina), I learned the values of integrity, of faithfulness to God, of brotherly love and of true love towards one’s parents. “I am blessed!” Ricardo López Jr.